Send your advertising dollars further and watch as they direct more customers your way. When your South Jersey business advertises in our Blue Envelope of coupons, you’ll benefit from the low cost of shared direct mail advertising. But where your ads go is all up to you. Choose the neighborhoods to mail, how frequently and via what print format, from coupon inserts to multipage circulars. You’ll always have a clear picture of your return on investment with Valpak of South Jersey performance tracking tools. We keep a running record of engagement between your company and customers, both on and offline. So you can keep track of the calls, clicks, view and leads our print and digital campaigns generate. 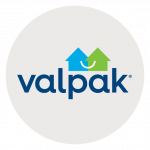 Connect with Valpak of South Jersey to reach up to 320,000 qualified households in Atlantic, Burlington, Camden and Gloucester counties, including Cherry Hill, Mount Laurel, Egg Harbor, Cape May and surrounding New Jersey cities. For specific dates and coverage, contact your Valpak of South Jersey representative.